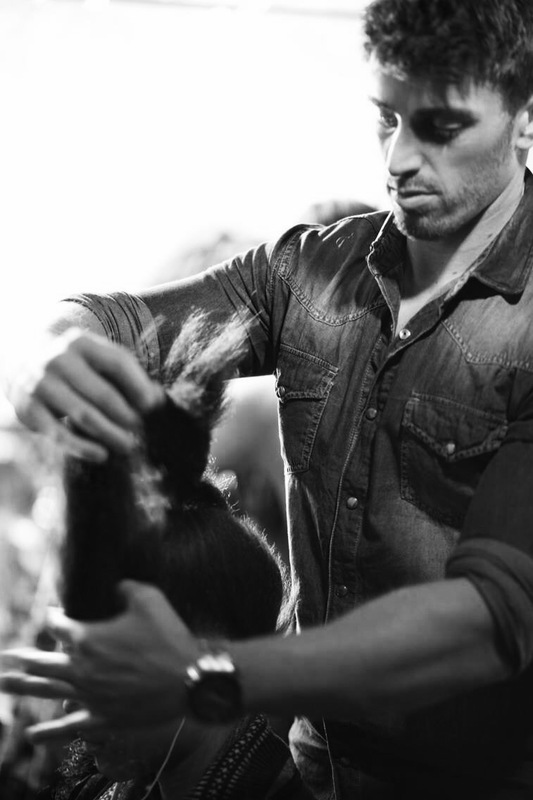 Editorial stylist and educator, Alejandro, brings almost 20 years of experience in the industry. He has worked backstage at the Victoria Secret Fashion Shows as well as New York, Paris and London Fashion Weeks, styling hair for a long list of top fashion designers. He has also styled countless celebrities including Adriana Lima, Gisele Bundchen, Miranda Kerr, Stephanie Seymour, Naomi Campbell, Milla Jovovich, Paris Hilton, Melanie Griffith, Fran Drescher, Vanessa Carlton and many more. He has worked on various editorial and commercial shoots including Vogue, Elle, W, Vanity Fair, V Magazine, Nylon, Cosmopolitan and Abercrombie along with Feria for L’Oreal and Garnier. Alejandro has spent years training and collaborating with some of the best hairdressers in the world including Garren, Max Pinnell, Italo Gregorio, Richard Ward, Laurent Philippon and others. Most recently, Alejandro worked as International Educator/Stylist for Bumble and bumble and has trained thousands of hairdressers around the world along with being the CEO and Founder of PROHAIRKIT.com. Once called, "the Manhattan style set's best-kept secret" by Allure Magazine (November 2006), Alejandro is now available to you! All the way from the United Kingdom, we bring you Master Colorist and Stylist Gary Topple. Trained by world renowned brands including Vidal Sassoon, WELLA and Bumble and bumble with over 12 years in the industry, Gary is no stranger to the "ART OF HAIRDRESSING". At Vidal Sassoon Academy London, he mastered the fundamentals of precision cutting. While at WELLA World Studio London, he honed his craft in Corrective Coloring, Red Carpet Hair, The Perfect Blow Dry, Glamour Styling, Color Essentials, Color Dimension, Creative Color and completed the esteemed "BEST of BRITAIN CUTTING and COLOR" program. His one-on-one training with Lead Colorist, Reese, from Bumble and bumble University/BbU has aligned him with numerous leaders in the industry. With his extensive knowledge and experience in the hair industry, you can be assured Gary is one of the very Best Hairdressers in Asheville! Shelly’s career in the hair industry began 5 years ago in Sarasota where she trained under lead stylists Brandon Turner and Kathryn Sutton. She then decided to take her skill set to a higher level attending classes by world renowned stylists Travis Parker, Jo Blackwell, Jay Olsen, Jenny Strebe ( @confessionsofahairstylist) and L’Oréal to name a few. Her excellence in the art of hairdressing led her to MTV’s reality show Siesta Key as lead stylist! Kellie is a graduate from the Aveda Institute of Orlando and a licensed Barber. She began her career at Salon Dulay where she completed an extensive two year cut and color apprenticeship where she honed her craft. Not only a seasoned hairstylist of 6 years, Kellie has been certified in many different services including Great Length Extensions, Deva Curl and Brazilian Blowout. Aside from working behind the chair, Kellie has worked on location as a hairstylist and makeup for countless brides and wedding parties. Tiffany is a graduate of the Aveda Institute in Chapel Hill. During her time at Aveda she collaborated on the Edwin Neil competition, Aveda Jam Fashion Show and NC State Fashion Show. She has also worked with Silverceiling Beauty Consulting where she mastered Airbrush Makeup and updo styling eventually becoming director. She continued her education in New York in Temptu Airbrushing and Glamseamless Extensions. While training with Cassie Siskovic of Kendra Professional and celebrity stylist, David Lopez she specialized in balayage and fashion colors. Most recently Tiffany’s work was featured on the cover of Southern Bride and Groom and has worked with multiple photographer and designers on styling shoots. Ella began her career as a Licensed Massage Therapist in 2010 after graduating from Space Coast Health Institute in Melbourne, Florida. She then traveled south and worked in Fort Lauderdale among the worlds largest yachting industry, including the International Boat Show and Shake a Leg Miami, a non-profit sailing organization. During this time Ella gained experience as a massage therapist working with people from around the globe. In 2012 she sought work in Asheville, NC with the world renowned Spa at The Grove Park Inn. Now, over eight years later, she continues to expand her professional career in massage therapy. Her experience includes certifications in Sports Massage with the Washington Nationals Baseball Club, Deep Tissue, Myofascial Release, Thai Massage, Reflexology, Hot Stone and Aromatherapy. Ella is an exceptional therapist that integrates a variety of techniques into each treatment customized to the individual client. She is delighted to be part of a new experience with an amazing salon, Ashes and Steel Studio. Step into Spring with a Côte d'Azur Massage. Introducing our "Glow" massage with foot and hand treatment using Oribe Polishing Body Scrub. We will hydrate, smooth and soften your skin with a 90 minute massage using Oribe Body Oil. While relieving stress with reflexology.